With the weather getting warmer, my thoughts start straying in the direction of picnics. Picnics, according to my personal definition which I have just made up, can be eaten indoors or out, at a table, on the ground or even in the car. There are certain parameters, however. The setting must be nice and the company good, but above all, what defines a picnic is the food. Picnic food must be casual and even a bit louche. Foods like cold fried chicken, that maybe challenge the boundaries of decorum to eat. Bread torn from the loaf, with a nugget of cheese. Food that is maybe unbeautiful, or unchic, but undeniably delicious. And the king of picnic food might just be potato salad. I don’t think I have ever met a potato salad I didn’t like. Warm German potato salad slick with olive oil, simple mayonnaise potatoes with herbs, purple potatoes with green beans and parsley, even that sweet yellow stuff from the deli with the bright red flecks of an unidentifiable pepper – I love them all. But something about this particular potato salad spoke to me – roasted potatoes made tart with vinaigrette and a trio of my favorite flavorings: capers, cornichons, and smoked paprika. I saw the recipe on the Wednesday Chef, who got it from Breakfast Lunch Tea, the many meals of the Rose Bakery by Rose Carrarini. This is one of those recipes that’s a pleasure to prepare, a pleasure to look at and a pleasure to eat. It makes me want to own the cookbook, just to have more recipes like this. You parboil the potatoes before roasting them, to make them cook more evenly (a trick I also used in this dish), and the salad is just some chopping and assembly. It’s good warm, it’s good cold, and it’s good everywhere in between. It is, in fact, perfect picnic food, wherever your picnic may be. Preheat the oven to 425°F. Cover the potatoes in water in a saucepan, cover the saucepan and bring to a boil. Drain the potatoes immediately, cut into wedges or thick slices, and scatter on a baking sheet. Drizzle with olive oil, season with salt and pepper, and roast until they're brown, about 30 minutes. Combine in a large bowl the vinegar and mustard. Add about ¼ c. olive oil and stir until emulsified. 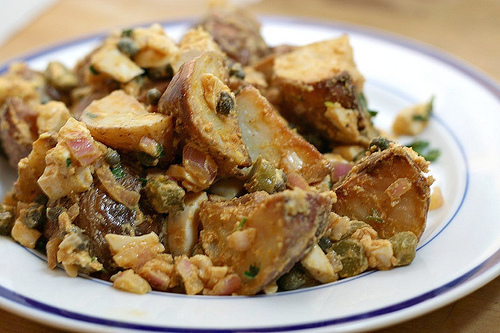 Add the potatoes, eggs, cornichons, capers, shallots, paprika and salt and pepper to taste, and toss gently to coat. Fold in the parsley and taste for seasoning. This looks really delicious! I love cornichons and have a hard time making them last long enough to use in a dish.